WASHINGTON (CNN) -- The highly controversial no-warrant surveillance program initiated after the September 11 terrorist attacks relied on a "factually flawed" legal analysis inappropriately provided by a single Justice Department official, according to a report to Congress on Friday. 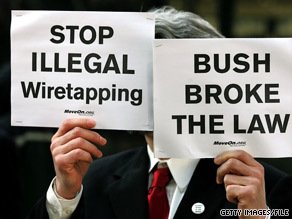 A demonstration in Chicago in 2006 protests the Bush administration's wiretapping program. The report was compiled by the inspectors general of the nation's top intelligence agencies, the Pentagon and the Justice Department. The 38-page unclassified version of the document reaches a cautious conclusion, stating that any use of the information collected under the surveillance program "should be carefully monitored." The program, launched by President Bush in the weeks after the September 11 attacks, allowed for -- without court approval -- the interception of communications into and out of the United States if there was a "reasonable basis" that one of the parties was a terrorist. The report, though not critical of the program's objectives, sharply criticizes the legal advice provided to the White House by the Justice Department. Among other things, the report cites a Justice Department conclusion that "it was extraordinary and inappropriate that a single DOJ attorney, John Yoo, was relied upon to conduct the initial legal assessment" of the surveillance program. "The lack of oversight and review of Yoo's work ... contributed to a legal analysis of the [program] that at a minimum was factually flawed," it says. The report says Yoo largely circumvented both his boss, Assistant Attorney General Jay Bybee, and Attorney General John Ashcroft. Yoo, described by Bybee in the report as "the White House's guy" on national security, also provided the legal justification for the CIA's controversial harsh interrogation program. Yoo's legal rationale was later repudiated by the Justice Department. The bitter debate within the Justice Department over the legal basis for the warrantless surveillance and related intelligence efforts is highlighted in references to the much-documented dramatic account of a March 2004 confrontation in Ashcroft's hospital room. Deputy Attorney General James Comey defied then-White House Counsel Alberto Gonzales by refusing to sign off on the re-authorization of the program. The report notes that several members of Congress -- including then-House Intelligence Committee Chairwoman Nancy Pelosi -- were briefed on the program on October 25, 2001, and a total of 17 times before the program became public in 2005. The document repeats the public assertion by former National Security Agency Director Michael Hayden that no member of Congress had urged that the program be stopped. The new report makes clear that the President's Surveillance Program was only a small part of the counterterrorism intelligence efforts in the aftermath of the September 11 attacks, and its impact even today remains unclear. Most of the intelligence officials interviewed by the inspectors general had, according to the report, "difficulty citing specific instances where PSP reporting had directly contributed to counterterrorism successes." The report was compiled by inspectors general of five agencies despite the apparent refusal by key figures -- including Yoo, former Attorney General John Ashcroft and former CIA Director George Tenet -- to be interviewed by investigators. Those who consented to be interviewed by the investigators included Hayden, former Director of National Intelligence John Negroponte, former White House Counsel and Attorney General Gonzales, FBI Director Robert Mueller and former Secretary of Defense Donald Rumsfeld.